Summer might be winding down, but don't whip out your scarves and riding boots just yet -- unless they accentuate your disco dancing moves. Here Lies Love, the David Byrne and Fatboy Silm album-turned-musical about the life of the controversial Filipino first lady Imelda Marcos, is hosting summer Friday performances at 5 p.m. on Fridays at the Public Theater through September 5. The earlier start time accommodates both New Yorkers with free afternoons and actors around the city who might have nightly shows. Following the performance, the cast, audience members and special guests mingle at the Public's Library Bar. The events have welcomed everyone from Dulé Hill to Joel Grey. However, there are some "names" in the cast as well. Star-on-the-rise Conrad Ricamora, who plays revolutionary Ninoy Aquino, is currently pulling double duty filming the new Shonda Rhimes show "How To Get Away With Murder," which stars Viola Davis and will premiere on ABC this fall. Here Lies Love marks Ricamora's first show out of graduate school, and he landed the part at an open call audition. At the bar after the show, Ricamora chatted about how the producers of "How to Get Away With Murder" weren't familiar with his work in Here Lies Love before he went in to audition. Ricamora definitely has a good track record of making a good first impression. 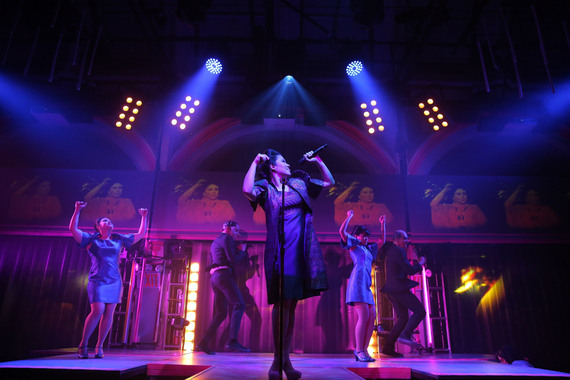 For those unfamiliar with the show itself, it's an 80-minute immersive dance party, and performers encircle the audience on moving platforms, and a DJ and neon-jumpsuit-clad stagehands keep attendees in line as the show moves around the room. While the early bird Friday special left a little to be desired among the audience members in terms of dance moves, the cast does not let up and the experience is transformative, whether you're in the mood to move or not.